Molde is a sans serif family font created by Juan Pablo De Gregorio and published by Letritas which is available in 6 widths with 3 version (Regular, Italic, Revers). Each version has 9 weights (from Thin to Heavy) and each weight contains over 600 characters and multilingual support. This neo-grotesque typeface is a versatile and is suitable for display, logo, magazine, text,web etc. Enjoy Molde font! 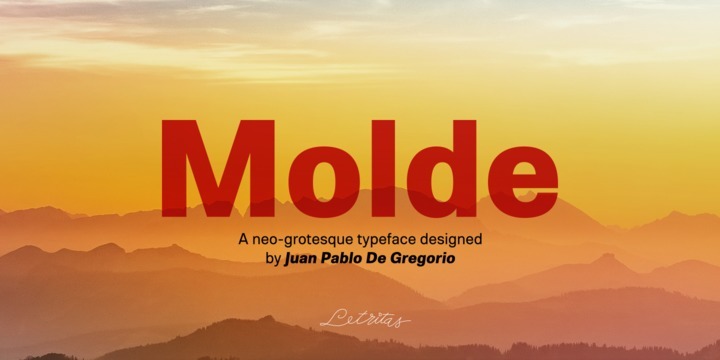 A font description published on Thursday, November 9th, 2017 in Fonts, Juan Pablo deGregorio, Letritas by Alexandra that has 3,110 views.